The stars here refer to celebrities you idolize in Hong Kong, with the images of the most famous drawn on one wall, and a few photos of some lesser celebrities who came for a visit on the other. Some of them seem surprised to be having their photo taken. The mortals that run the place are dressed in 90's style neon yellow and have to fight to hear your order over the cacophony of loud Cantonese voices that echo around. A good way to begin is the H.K. style milk tea & coffee mix ($1.65, below), which tastes exactly as you might expect. It is a popular drink there apparently, and tastes more like milk tea than coffee, because technically it should be 70% tea. 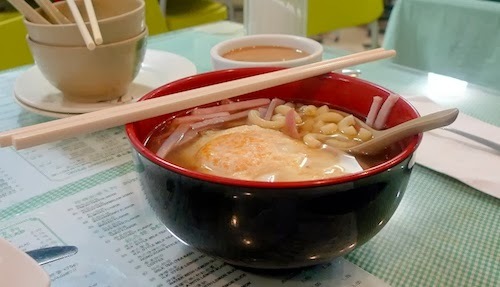 The macaroni with ham ($4, below) is actually a clear salty broth soup served with an egg. No doubt this is comfort food, and a peculiar mashup for sure. Throw in a nice amount of white pepper to give it a necessary edge. 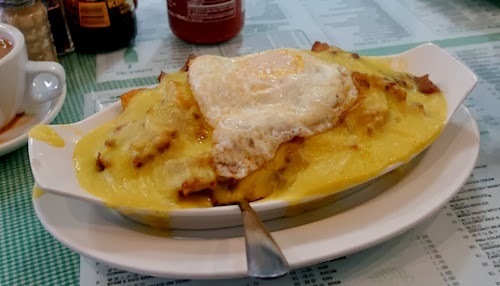 Another fun mashup is the baked chicken Portuguese style ($6.50, below), a casserole of rice, chicken, potatoes, sauce, and egg. The creamy yellow sauce is thick with corn starch and I could not come up with a descriptive word to describe the taste. The chicken has a very simple marinade, probably of soy sauce or just salt. The whole thing is deeply satisfying, perfect comfort food. I can only assume that "Portuguese style" is somehow adapted from some foreign tastes brought to Macau long ago, because you would actually never find something similar in Portugal. The place has very cheap prices, quick service, and no hassle. 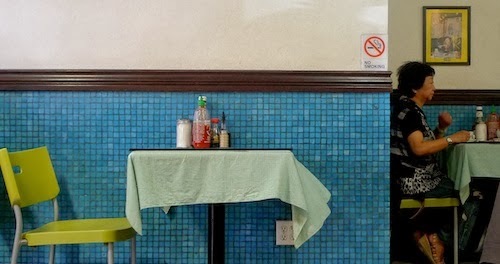 It is definitely the kind of joint people are not lingering around but instead in for a quick lunch on the go.